Handel's Messiah is ubiquitous at Christmas, with many groups bringing out their own particular vision of the work. It is a work which is robust enough to cope with performance as massed spectacular or intimate conversation. This latter approach is the one we might expect from Eboracum Baroque, director Chris Parson, a period performance group made up of young singers and instrumentalists. They are performing Messiah by candlelight on Saturday 10 December at Malvern Priory, and on Saturday 17 December at St John's College, Cambridge. Both concerts are in aid of Cancer Research, and give us a chance to get back to the relatively small scale approach to Messiah which characterised Handel's early performances of the work. 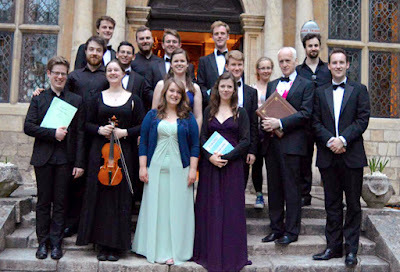 Eboracum Baroque is particularly known for championing the work of Thomas Tudway, whose music written for the Chapel at Wimpole Hall the group recorded in the venue for which it was written (see my review). Further ahead, Eboracum Baroque will be travelling to Estonia, to perform magnifacts by Bach and Vivaldi in Tartu (28 December 2016) and Tallinn (29 December 2016).